What Is a California Style Kitchen? The California style kitchen is an amalgam of many styles, from Mexican kitchen to sleek modern eco-friendly. A few things that distinguish a California kitchen are a built-in informality and the use of natural materials. You'll find wood and maybe tile in the kitchen – and definitely lots of light from big windows and glass doors opening onto a patio. The kitchen is all about cooking, food and company, so there's usually space for a table or an island to accommodate friends and helpful tasters. 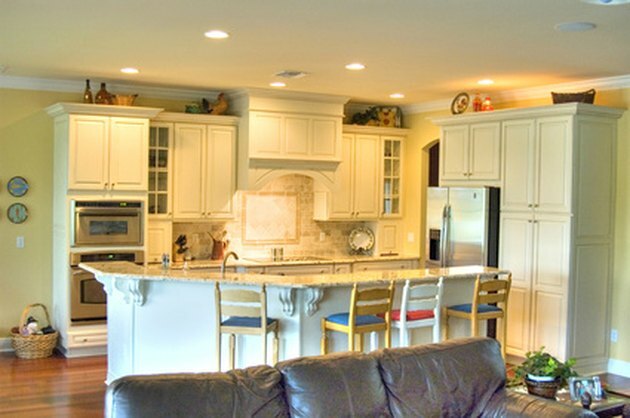 Open space and islands with seating are features of California-style kitchens. California-based Sunset Magazine sponsored a contest to choose elements of a dream kitchen and picked up a contemporary vibe. A large, open space with a big island defined the favorite designs. A cooktop for several chefs was set in a Corian island counter and sleek modern bar stools provided plenty of seating. The kitchen opened directly into the living room which flowed onto a patio. Natural wood floors, honey-colored wood cabinets and lots of white on walls, counters and glass tile backsplashes bounced light around the room. An adjacent pantry had its own sink and ecologically-friendly bamboo countertops. Spare, social, natural, bright and easy-to-clean were top picks on the style list. A cook's kitchen is centered around a nice stove. In a 1920s Los Angeles house a 1924 vintage stove dominates a wall and dictates the chef's culinary techniques. Pine cabinets, reclaimed wood shelves and lots of tile attest to a Mexican influence, with terracotta floor tiles that have darkened with age and are polished to a hard shine. Big casement windows over a double sink set in grouted turquoise tile let in all the California light and a verdant glimpse of the landscaped patio. The many vintage touches are underscored with old citrus labels from California fruit growers and big bowls of fresh fruit on counters and tables. If you are fortunate enough to have an old California kitchen, preserve as many original details as possible to maintain its authentic charm. A Venice Beach shack uses found and homemade features for a clean California cook's kitchen that would be at home in a renovated cottage, too. The owners rebuilt a condemned wreck themselves, installing a low-cost, very functional kitchen. Glass front and closed wood cabinets are pulled together with redwood stain. Cabinet facings hide pullout pantry drawers to make the most of limited storage space. Bamboo floors and DIY poured concrete counters on a small island and the sink wall save money and are kind to the environment. Light concrete can be finished with food grade mineral oil and beeswax for a shiny protected surface. New and slightly used brushed steel appliances keep it easy to care for and modern so there's plenty of time to spend at the beach. California has many period homes of architectural significance – with cramped, amenity-free kitchens. Modernizing a San Francisco Craftsman home can respect the architectural style without sacrificing comfort. The color palette uses Craftsman shades in light tones. Pale greens, creamy yellows, light and medium woods and a few neutral glazed tiles open up the room. The expanse of wood floor unifies the space as does keeping all cabinets white. Reproduction cabinet hardware and pendant lamps maintain the period flavor. Concrete counters are a new material that blends with the classic Craftsman wood and ceramic tile and with the salvaged madrone wood slab used for food prep, snacking and a companionable homework station.